Breast Cancer Awareness: Did You Know? Breast Cancer Awareness month is dedicated to the recognition, awareness and understanding of breast cancer, launching the necessity for early detection. There are remarkable group efforts to raise monies to fund research and education. Many individuals offer their immense knowledge and strategies to ensure healthy success. The better informed, the more empowered you are to take an active role in your own wellness. 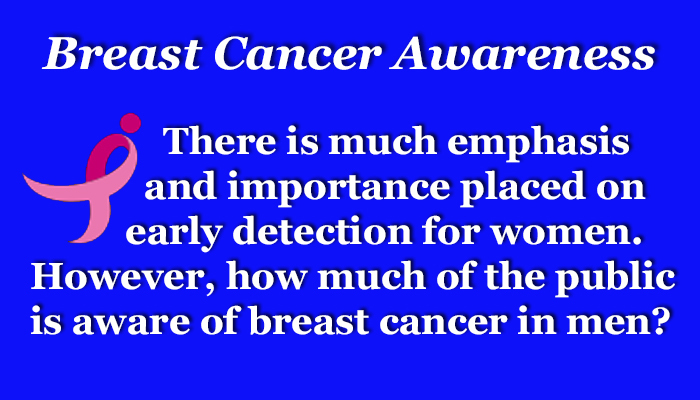 Early detection is the key to survival. There is much emphasis and importance placed on early detection for women. However, how much of the public is aware of breast cancer in men? my grandmother. It was my father. Education is the bridge to safe guarding everyone we know from such a fate. By the time my dad found the lump, the cancer had spread to his lymph nodes. His generational guidelines taught him to stay in silence. He took the personal oath to withstand all the adversities alone. No one should ever be alone. too long!” The echo of our fear began to drive a piercing, hollow sensation and hours spoke volumes: it must be the imaginable, a malignancy. What, a man has breast cancer? That is unthinkable. I made the vow to educate the world. Breast cancer is not isolated to women. Statistically it is more common in women; however, I venture to say it befriends those that have been environmentally endangered by cigarette smoking and other hazards, as well as the role of genetics. in spite of such strife, he was a living testimony to the recognition of gratitude. He was forever grateful for what he received in his life. His valiant courage taught me the gentleness of acceptance and endurance. Every experience in life becomes a teacher. It is what we choose to do with that experience, how we handle the challenge thru our thoughts, reactions and actions. My prayer in my lifetime is to see breast cancer extinguished, so no one has to ever endure such adversities. My dad is my heart and soul friend. He taught me to be strong, confident and fearless. it was needed for the sake of my son and grandchildren to be informed. Many years ago my dad taught me that 95% of what we worry about never comes true, so how could I let him down now? My son, my grandchildren and I were all blessed. I do not have the BRCA-1 gene. Be informed. There is a wealth of information available. It is unconscionable behavior to pretend that it is never a possibility. Early detection and testing is the only assurance to making a conscious choice. Lastly, become involved. Join others either by personal involvement, partner with a friend to participate in a walk-a-thon or support someone through a monetary pledge. Take one step towards a cure, go to: Susan G. Komen for the Cure. Listen to an engaging, inspirational story of one woman’s personal journey of courage, her story about her survival of breast cancer, go to: Stacy Shelton.